Founder and CEO of Disabled International Foundation Sierra-Leone /UK Which is responsible for more than 5,000 disabled people of all categories as well as over 2,000 orphaned children, as a result of the Ebola epidemic. Have been awarded on October 2015 the New Pan-African Princess. A Disability Rights Activist, who frontline experience at the challenges that they face. A Women and Children Rights Activist, Human Rights Activist, Social inclusion and Poverty Reduction activist. Has undertaken to Build an orphanage and school complex envisaged to help the disabled towards self-reliance. 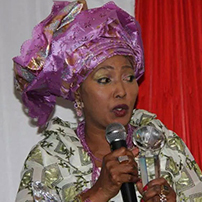 An International Female Genital Mutilation (FGM) policy implementation advocate. Also, a signatory to the implementation of this policy in the UK. A Key Campaigner to stop early child marriage. An activist for raising awareness for the eradication of discrimination towards the disabled. Has been at the forefront as a campaigner and policy advocate for Human Rights and Quality Education/skills for the disabled in Sierra-Leone and Africa. Was instrumental in the establishment of the Disability Act 2011 in Sierra-Leone the resulted in the first Disabled Deputy Minister of Social Welfare, Children and Gender Affairs in Sierra-Leone. Has been a recipient of several awards for Humanitarian work both in the Continent of Africa and globally.